Lacura Renovage premium skin care range is part of Aldi's affordable skin care products. 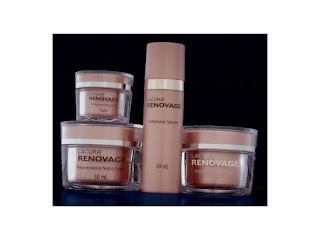 Their Renovage range contains anti ageing PhytoCellTec complex based on apple stem cells from a rare Swiss apple tree. Now what that means is these apple stems stells help protect our skin from UV and pollution as well as helping our own aged stem cells form new skin cells, producing younger looking skin. Sounds great to me but does it work? I purchased the complete range about three months ago and have been using them ever since and the following is my thoughts on each product. There are four products, Intensive Serum 30ml, Protective Day cream 50ml, Rejuvenating Night cream 50ml and the Protective Eye cream 15ml. The Intensive Serum is in a vacuum pump bottle which you apply to your face and neck area morning and night after cleansing and before you moisturise. It is a light lotion which absorbs easily into your skin, one pump is all you need for your face and neck area. Aldi on their website describe this as a light serum formulated with Vitamin E and Provitamin B5 and they claim it helps regenerate, firm and improve skin complexion. The also say it is an ideal base to wear under makeup due to its light formula. This is my favourite of the four. One pump certainly is enough to do your whole face and neck area, my skin does feel softer, firmer and small lines are minimised. I like how this lotion quickly absorbs into my skin with no greasy after feel. Not enough of a moisturiser for me that I would use it as a base for my makeup without applying day moisturiser first but I do like it and feel it is a great boost to my skin routine. Even if I changed moisturisers I would continue to use this serum. This cream is absorbed easily into my skin and I don't need a lot especially after I have used the serum. There is no greasy after feel and it leaves my skin feeling lovely, well hydrated and ready for foundation. The Rejuvenating Night cream is very much like the day cream but contains the extra benefits of grape seed oil and shea butter for a healthy boost of moisture to help replenish what your skin has lost during the day. This cream feels very much like the day cream to me, it certainly is hydrating and my skin benefits from the extra ingredients but with the application of Intensive serum beforehand I think you could probably just use the day cream at night as well. The Protective Eye cream, contains parts of the avocado (I don't know which ones). Aldi claims this cream helps strengthen the skin barrier around the delicate eye area and helps reduce fine lines and wrinkles. You can use this cream day and night. I like this eye cream, you only need a tiny amount, I dot it around my entire eye area and pat it in. Again this cream absorbs easily and leaves no residue I can honestly say it has helped with my eye puffiness which is completely gone now and has certainly firmed the skin around my eyes. The skin around my lids and undereye are plumper, eyeshadow application is easier and smoother, not so much crepey eye. This range has worked for me, I have noticed a marked improvement in my skin, it is firmer and more youthful looking. My makeup applies and looks better and I have received many compliments about how well I am looking, how beautiful my skin is and I couldn't possibly be 46 years old. Overall I like these products, they do what they say they will and I like that they are entirely absorbed into my skin with no greasy heaviness, my skin looks and feels great, I will certainly continue to use them. They sell for $19.99 each in Australia and I have only used about half of what is in the containers in 12 weeks so they will last a good 6 months, I think that's great value. I was reticent at first trying skincare from Aldi and I am really surprised and pleased with how well they have worked. I have gone back now and tried other Aldi products and I am quite impressed with the whole Lacura range. It's good to know that you don't have to spend a fortune for excellent skin care.